Now nearly 150 years later, Ottawa is home to another heated debate on whether the community should put a curb to the ever-intensifying silica mining in LaSalle County. Mining companies are no strangers to Ottawa. For over 100 years LaSalle County has been a major sand and glass center. The reason for this has been its location: a combination of numerous silica sand deposits close to the Illinois River and the Illinois Railway Ottawa Line. Thanks to transportations companies like Archer Daniels Midland Co. and American River Transpiration, it’s a perfect one-stop shop for sand across the state and even the world. “U.S. Silica has been in Ottawa since the 1860’s,” said Ashley Williams, 23. She’s one of the residents fighting to have the mining companies lower their sand mining or stop it altogether. Because mining has been in the town for over a century she said residents of the county have come to accept it as part of their identity. But she argues that that point of view is what has allowed companies like U.S. Silica to come in and take advantage of the county. This increase in silica “frac” sand mining is thanks to the high demand for it in downstate Illinois. This is because subsurface rock units such as organic shale contain large amounts of oil, natural gas or natural gas liquids that will not flow freely to traditional mining with a drill. In these cases the rock either lacks permeability (interconnected pore spaces) or the pore spaces in the rock are so small that these fluids can’t flow through them. 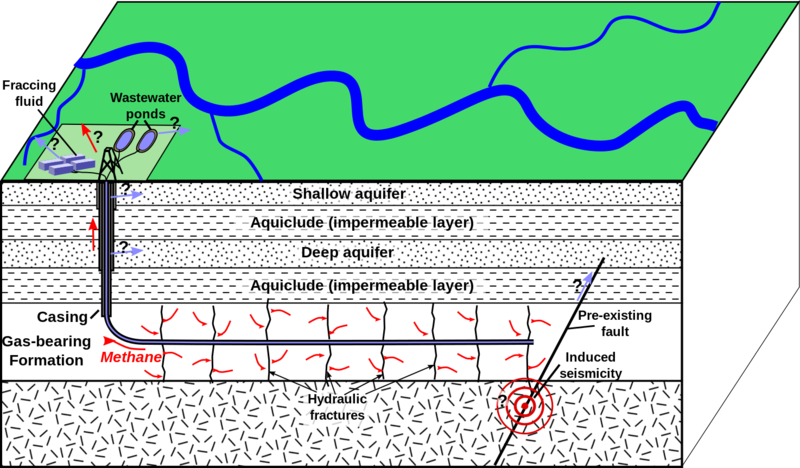 Hydraulic fracturing, or fracking, solves this by drilling a well into the rock, sealing the portion of the well in the petroleum-bearing zone, and pumping water under high pressure into that portion of the well. This water is generally treated with chemicals to create a viscous gel. This gel makes it easy for the water to carry grains of the silica sand. Then large pumps on the surface increase the water pressure in the sealed portion of the well until it’s high enough to exceed the breaking point of the surrounding rocks. Soon a breaking point is reached and the rocks break, allowing water to enter the fractures. As this happens they inflate and extend the water pressure deeper into the rock. This allows billions of silica sand grains to enter deep into the fractures with this sudden rush of water. The process requires silica sand because of its purity, durability and small size, resulting in a few thousand tons of the sand used per well. Because of this LaSalle County’s silica sand is essential for the state to ramp up its oil and gas drilling production. 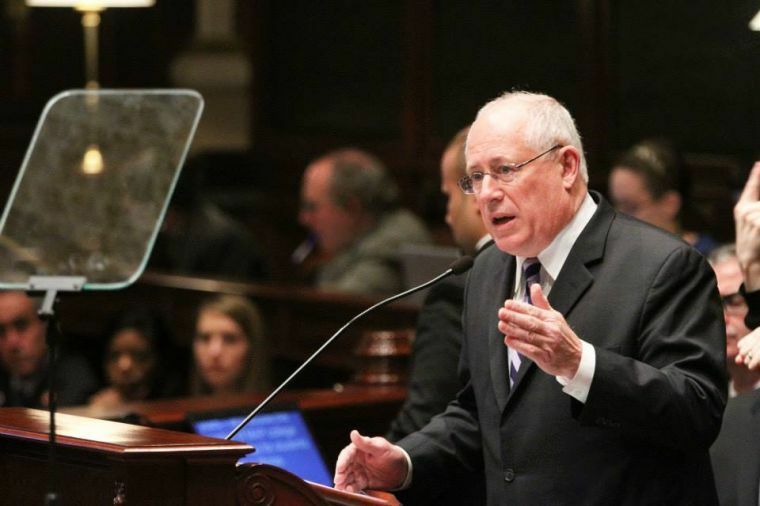 During his 2014 State of the State speech, Governor Pat Quinn (D) said he was proud of the fact that the state had its lowest unemployment rate in almost five years. His speech was timed ahead of the March 18 primary and in it he further boasted that since last May, Illinois led Midwest in new jobs created. Yet environmental conservation wasn’t the only item on Quinn’s agenda as his campaign engine revved up for the November general election. Quinn knows he needs to show the struggling state he can create jobs outside Chicago and its collar communities, namely downstate Illinois: a region that has, historically, shared little if any identity with the Chicago area. Southern Illinois was given the nickname of Little Egypt during the 1830s. No one’s really sure why but one-folktale claims it’s because poor harvests closer to Chicago drove people to Southern Illinois to buy grain. Another claims it was because the land of the great Mississippi and Ohio River valleys resembled the Egypt’s Nile delta. Regardless, the Illinois oil basin is located mostly in that area. During the early 1940s and 1950s, Little Egypt had a modest oil boom in towns such as Carmi, McLeansboro, and Lawrenceville. During that time oil production reached more than 140,000,000 barrels a year. However the oil wells began to dry up by the end of the 20th century and by 1995 the rate of production had dropped to 10,000,000 barrels a year. Since then wells in the region have had a relatively low yield and produce oil with a high sulfur content, making it expensive to process. Up until 2013, there has been no significant drilling activity in the basin since the late 1970s. This changed when Quinn signed legislation to expand fracking in July of 2013. The oil and gas trapped in Little Egypt’s underground rocks would now be broken up and sucked up by wells thanks to mining techniques that relied on silica sand from LaSalle County. With his reelection race right around the corner, Quinn signed the law expecting a down state job boom within six months. The only hurdle in his way was Illinois Department of Natural Resources, who had to complete drafting regulations for enforcement of the new law. As of May of this year the IDNR was still working through the legal jargon Quinn’s 100-page law, with no finalized regulations for fracking issued yet. State Senator Iris Y. Martinez (D) voted against the bill to allow fracking. She’s represented the 20th District since 2003 and is assigned to the energy committee. She said he voted against the bill because she felt that the legislature’s vote was “jumping the gun” as reports detailing the impact of fracking on the state had not been finalized. She said that IDNR’s slower pace in drafting the rules was most likely due to the department’s desire to review the public comments they received on fracking. The IDNR held five public hearings on the proposed rules earlier this year, with public comments on the issue closed on Jan. 3. The IDNR said they are reviewing about 35,000 public comments received during that period. Interestingly, the law’s advocates complain the law is one of the most restrictive in the nation while its opponents are afraid the drawn-out drafting of rules will help the gas and oil industry. Martinez said there are a lot of people in the downstate area that are becoming impatient with the rule drafting process, but she said it was important that regulators take their time and be fair. Specifically that the residents and environment are protected from the oil and gas companies wishing to open up shop in the state. “There has to be protection from them on paper,” said Martinez. When IDNR completes review of the public hearings on fracking and makes any necessary changes to its draft rules, it will transmit the revised rules to the Joint Committee on Administrative Rules (JCAR) of the General Assembly to start the “second notice” period – a 45-day period consisting of review by the JCAR staff, and then consideration at a public meeting of JCAR’s legislative members. IDNR’s submission to JCAR will include a summary and analysis of “the thousands of public comments received,” and is expected to be made available on IDNR’s website at www.dnr.illinois.gov. The deadline for the IDNR to finalize regulations is November of this year. For the Illinois Manufacturer’s Association, that’s too long a waiting period. They’ve gone on record to say that they’re disappointed that they’ve waited nearly a year for rules to be passed and fear that oil and gas companies will leave the state because of the delay the IDNR has caused. In this vein, a new bill introduced by Springfield legislatures hoping to speed up the drilling process in Illinois was introduced May 23. If passed, the bill would allow the state to skip over the IDNR’s rule drafting process to allow oil and gas drilling in the state as soon as possible while also imposing a moratorium on fracking in Northern Illinois. However it died in the legislature during the final week of May. This bill isn’t alone; Martinez said so far 13 bills to rewrite the fracking law Quinn signed last year have been introduced in the legislature. She said that there were still a lot of questions regarding environmental protections that are still pending regarding fracking in the state before companies are allowed to come and start drilling. This entry was posted in Media, News Stories, Ripped from the headlines and tagged Chicago, Drilling, Environment, Fracking, Gas, Illinois, Illinois Manufacturer's Association, Illinois River, Iris Y Martinez, LaSalle County, Little Egypt, Oil, Pat Quinn, Silica, U.S. Silica, Utica. Bookmark the permalink.